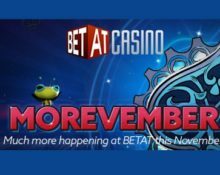 Betat Casino – “Morevember” / Week 3! More happening in the third week of Morevember! Two weeks of this awesome campaign at Betat have passed in a blink of an eye. Time too look at the offerings for the third week, where they added a 100% deposit bonus for selected players. Watch out for an email notification as they will double your next deposit with up to €100 in bonus chips. After devouring that balance booster, players can move on to Free Spins on deposit, wager rewards and a thrilling competition for the highest win on a single spin on any slot. No time for lazy afternoons, get spinning. There is so much happening at Betat this month, it almost feels like it is Christmas already after the first week. The second week will be just as good with more Free Spins on Tuesdays, Live Casino Cashback on Wednesday, Deposit Bonuses on Fridays and wager rewards throughout the week. To top it all off, there will be a fierce competition for the highest bet multiplier on a single spin with the winner walking away with a cool €1,000 in cash. A extra deposit match offer has been sent to selected players on Monday with a 100% deposit bonus, up to £/$/€ 100. Check your email messages for the personalized deal. Wagering requirement is 40x bonus with only bonus funds contributing. Winnings from cash bets can be withdrawn at any time as long as the bonus balance has not been used. Bonus terms and conditions apply. Every Tuesday in November, Betat will be dishing out new codes for Free Spins on deposit for the most popular games. Players will have 24 hours to claim them with codes being updated weekly. Wagering requirement is 10x FS winnings, subject to the Betat bonus terms and conditions. Need a little something extra to get you over the hump day hurdle? Betat has you covered with a 25% cashback bonus when playing Roulette and Blackjack on Wednesdays throughout November 2017. Cashback bonuses are credited on Thursday morning with a 30x wagering requirement. Minimum cashback bonus is €15, maximum is €500. Bonus terms and conditions apply. Do you know that you can bump up your balance just by wagering at the casino? OPT-IN to Roll Baby Roll and you can do just that. Betat will credit you with an extra €1 for every €100 wagered on slot games, irrespective of whether it is a winning or losing bet. The extra balance will be credited every Monday throughout November 2017, up to €200 per week. Wagering requirement is 30x bonus amount, subject to the Betat bonus terms and conditions. Land yourself the highest win multiplier on a single spin throughout the month and you will bag €1,000 in cash. OPT-IN now and keep spinning if you’re in it for the winning, it’s anyone’s game. Only wins with cash funds are eligible.